What's the third wire on a piezo buzzer? Most piezos I've seen have just two connections, but this type has three. What's the third wire for? The piezo effect works both ways: if you apply a voltage the piezo stretches, but also if it stretches it creates a voltage. This principle is used to create a feedback signal which drives the oscillator. The advantage of the self drive is that it will automagically work at its resonance frequency, where it produces the loudest sound. In 2-wire circuits the oscillator's frequency is independent of the piezo's resonance frequency, and it's the designer who has to make that they're close. Here is a good in-depth explanation of buzzers including self-driven ones + some usefull schematics: Piezoelectric Sound Components Application Manual (812kb). Method Fig. 9 shows a typical application of the self drive method. 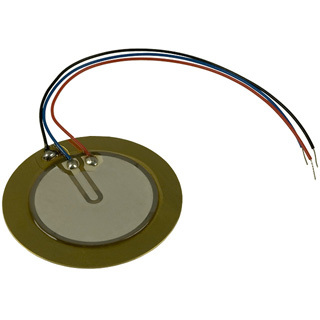 The piezoelectric diaphragm provided with feedback electrode shown in Fig. 9 (i) is involved in the closed loop of a Hartley types oscillation circuit. When the frequency is closed to the resonant frequency, the circuit satisfies oscillating conditions, and the piezoelectric diaphragm is driven with the oscillating frequency. Fig. 9 (ii) shows a simple oscillating circuit consisting of one transistor and three resistors. In general, the node support shown in Fig. 3 (a) is popular in the self drive method. Proper resonance of the piezoelectric diaphragm by the node support provides stable oscillation with high mechanical Qm of vibration but also a single high pressure tone. Not the answer you're looking for? Browse other questions tagged piezo-buzzer or ask your own question. Why does the buzzer in this circuit have a voltage drop of 0.7V? 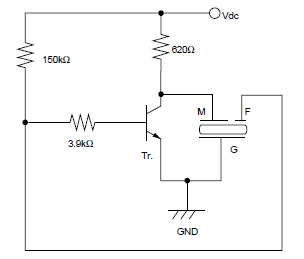 What's the function of the diode in this driver connected to a piezo buzzer? 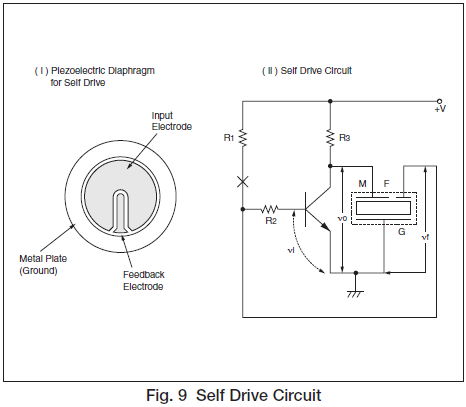 Does the drive circuit for a piezo buzzer require extra power? Safe to remove piezo-buzzer from this PCB?